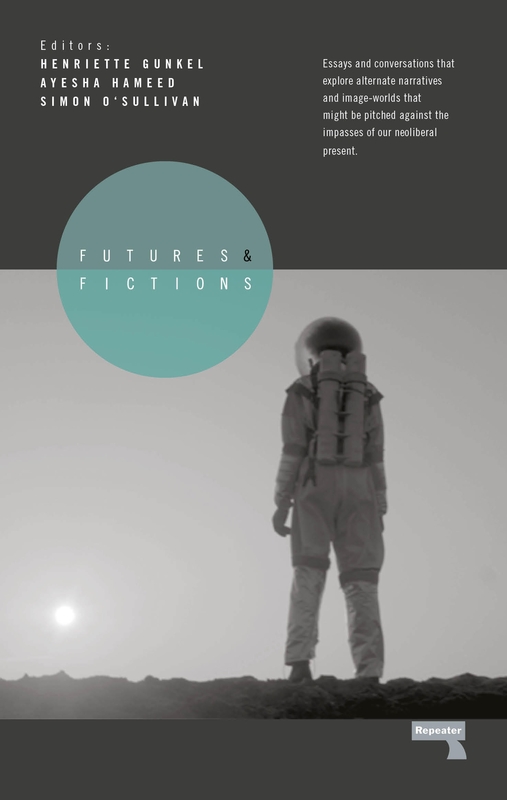 Futures and Fictions - In what ways could we imagine a world different from the one in which we currently live? Futures and Fictions, Henriette Gunkel, Ayesha Hameed, Simon O’Sullivan, Eds., Repeater, 2017. This is the question addressed by the essays and conversations in Futures and Fictions, which explore possibilities for a different “political imaginary”;. With discussions around decolonization, new Afro- and other futurisms, post-capitalism, science fiction, and new kinds of social movements and the intersections of these with contemporary art practice and visual culture Futures and Fictions creates a space for alternate narratives and image-worlds that might be pitched against our neoliberal present. Contributions from Oreet Ashery, AUDINT (Eleni Ikoniadou, Steve Goodman, Toby Heys), Annett Busch, Bridget Crone, Elvira Dyangani Ose, Kodwo Eshun, Mark Fisher, Stefan Helmreich, Julian Henriques, Daniel Kojo Schrade, Laboria Cuboniks (Patricia Reed, Amy Ireland, Helen Hester, Diann Bauer, Ica-rina Mali Burch), Ursula K. Le Guin, Kemang Wa Lehulere, Robin Mackay, Louis Moreno, Sam Nightingale, Harold Offeh, Luciana Parisi, Theo Reeves-Evison and Judy Thorne.